Fresh apples give this butternut squash soup recipe a sweet kick. 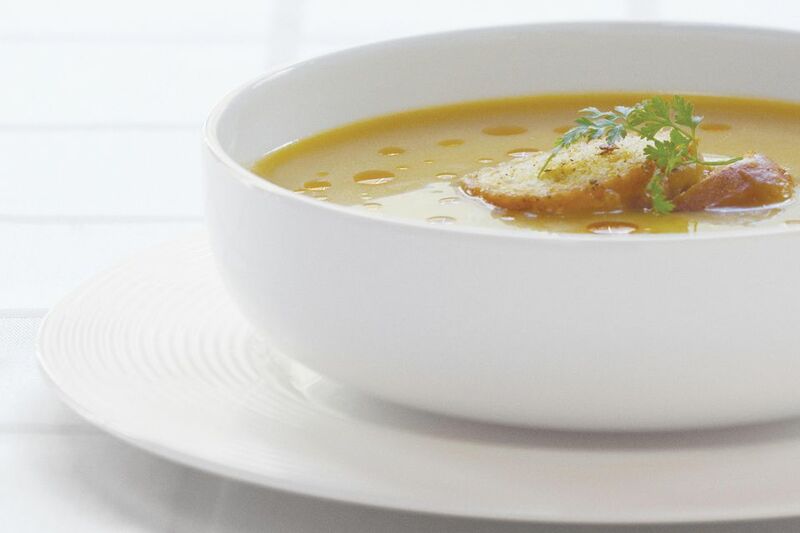 Butternut squash soup is very easy to make and can be made well in advance and reheated. 1. To roast butternut squash: cut a butternut squash lengthwise, then in half to make 4 sections (see photo), and scoop out the seeds with a spoon. 2. Wrap loosely in foil, place on a baking pan, and roast in a pre-heated 375 degrees F. oven for 1 hour, or until the butternut squash is tender. When cool, scoop out, discard skin, and reserve. 3. Melt the butter in a 4-qt saucepan over medium heat. 4. Add the onions and apples; sauté until the onion turn translucent, about 5 minutes. 5. Add the garlic and cook for 1 minute more. 6. Add the stock, and reserved butternut squash; bring to a simmer and turn the heat to low. Simmer for 20 minutes, stirring occasionally. Water may be added at any point if a thinner texture is desired. 7. Blend until completely smooth with a stick blender, or pour into a conventional blender then return to the pan. 8. Add the cream and bring back to a simmer. 9. Turn off heat and season with salt and fresh ground black pepper to taste. Serve hot.